Apple has added a page for the 2016 Worldwide Developers Conference to its events website, confirming plans to live stream the keynote event on June 13 at 10:00 a.m. Pacific Time. The keynote event, which will take place at the Bill Graham Civic Auditorium in San Francisco, will be available on Macs and iOS devices through an event stream on Apple.com and on the Apple TV through an events app. On the second and third generation Apple TV, there will be an event channel, and on the fourth-generation Apple TV, the event will either be watched through the dedicated WWDC app, which expanded to the Apple TV this year, or through an upcoming events app. Apple has not yet updated its apps on the Apple TV to reflect the streaming information. As always, MacRumors will also be providing live coverage of the event on MacRumors.com and through the MacRumorsLive Twitter account. The 2016 Worldwide Developers Conference is expected to focus on new software and services, with Apple debuting new versions of iOS, OS X, watchOS, and tvOS, along with potentially introducing new Apple Pay features. Brushing up on my Mandarin! Blocked off the time at work. Booked a conference room. Charging my ipad. Pop corn cooking. Did I miss anything? Hello, my name is Tim Cook. I killed Apple. This is their chance to surprise me, because i'm not expecting anything. I am ready for the half hour of game demos! Gah these are always the worst! 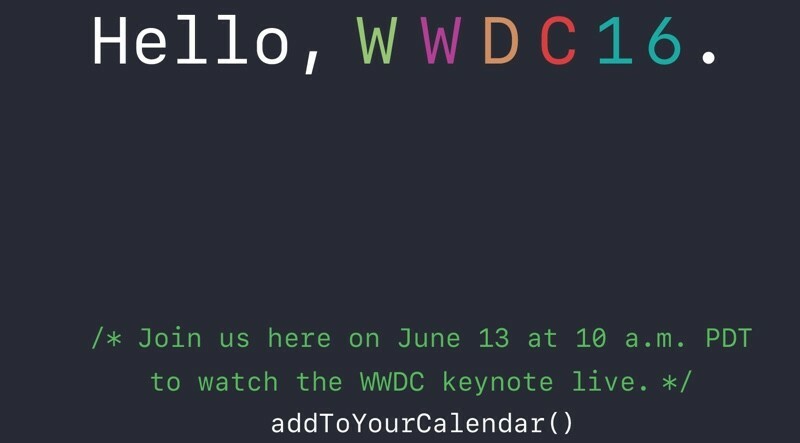 Apple has added a page ('http://www.apple.com/apple-events/june-2016/') for the 2016 Worldwide Developers Conference to its events website, confirming plans to live stream the keynote event on June 13 at 10:00 a.m. Pacific Time. On the second and third generation Apple TV, there will be an event channel, and on the fourth-generation Apple TV, the event will either be watched through the dedicated WWDC app ('https://www.macrumors.com/2016/06/03/apple-updates-wwdc-app-for-2016/'), which expanded to the Apple TV this year, or through an upcoming events app. Apple has not yet updated its apps on the Apple TV to reflect the streaming information. As always, MacRumors will also be providing live coverage of the event on MacRumors.com and through the MacRumorsLive Twitter account ('https://twitter.com/macrumorslive'). I don't know if I'll watch this time. I have a hard time with all the self-congratulation while most of Apple's current laptop offerings are more than a year old and may not even be updated this time around.